The above was one of our first chicken coops on the farm. It was cheap, easy to set up and very portable, but it left a lot to be desired in other ways. We have gone through a number of chicken coop designs since this photo was taken; I've shared below the lessons we've learned along the way. Chicken coops and poultry housing in general would seem to be very straightforward topics. Adult chickens don’t actually need a lot of specialized care – something dry, sheltered, clean, safe and comfortable, in terms of adequate feeding, roosting, preening and laying space. So why are there so many different styles of chicken coop? The most common reason has nothing to do with the birds’ needs, but rather with the flock owner’s needs. Sometimes the owner needs something compact, or inexpensive, or built from surplus materials. Sometimes the owner needs to comply with certain regulations. Sometimes neighborhood aesthetics dictate a fancier coop than would otherwise be justified. Perhaps the flock owner needs the dimensions need to be a little smaller, a little bigger, a little brighter or a little broader in order to be a more comfortable working environment. Sometimes the climate presents certain conditions – a lot of wind, a lot of rain, a lot of heat or cold or snow – which the coop must accommodate. Different regions have different predator pressures. And if nothing else, different people have different preferences. Which is why each coop is probably unique. Chicken Coop Plans - we've gathered a variety of sources together which offer dozens, if not hundreds, of chicken coop plans. Some of those plans are available for free download, others require a small fee. A few of them offer a tremendous amount of additional information on coop design, construction, features, etc. Building Materials – which materials work, and why? Which materials are more cost-effective and why? We'll look at structural materials, roofing/siding, foundation, fencing and even some alternative methods/materials. Feeding – We’ve already covered poultry nutrition, rations and ingredients in our Poultry Feeds section. In this Feeding page of our website, we’ll look t how much feeder space a flock needs, different feeder options, and some options for sanitation and vermin control. Nesting – For anyone raising or keeping laying hens, nest boxes are a crucial topic. The right nest box, in the right place and with the right materials, creates an environment for lots of fresh clean eggs. The wrong box, in the wrong place or with the wrong materials, results in a daily hunt for eggs, and smashed or filthy results. Roosting – With only a few exceptions, poultry instinctively seek out a branch, shelf or other elevated perch upon which to sleep at night. Many chickens will also rest and/or preen on roosts during the day. We’ll look at roosting materials, spacing issues, height issues and how to make the most of a coop’s three-dimensional space. Hot and Cold Weather Tips – Poultry are generally hardy creatures, who can comfortably tolerate all but the coldest, hottest, windiest or wettest weather. We’ll look at what protection they do need, and options for providing that protection in cost-effective ways. Protection from Predators – Most flock owners have already experienced, or will experience at some point, predation losses. We’ll look at how both terrestrial and avian predators prey on poultry, and what flock owners can do to minimize those losses. Protection from Vermin – Many small animals try to take advantage of access to the flock’s feed, the water, and/or the eggs. We’ll look at ways to prevent vermin from gaining access to a chicken coop, and what to do if vermin are already causing problems. Cleanliness and hygiene – rotten eggs are perhaps amusing as a practical joke. But they are no fun in the morning breakfast or in the customer’s purchase. Even if eggs are fresh, various coop hygiene issues can result in off-tasting eggs, or eggs contaminated with various germs. Beyond eggs, merely working in chicken coops can result in some health problems if waste or filth is allowed to build up. We’ll look at how to keep things fresh and clean, so that eggs always taste good and the flock owner can work with the birds without danger of illness or unpleasant conditions. 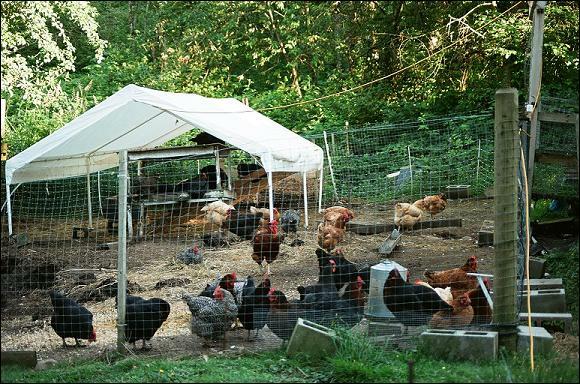 Broiler production – While most coop designs focus on layer hen housing, laying flocks and broiler flocks each have unique needs from their coops. We’ll look here at what broiler and roaster flocks need to grow quickly, safely and cost-effectively. Brooding and chick rearing – Many people enjoy raising their own birds from day-old chicks. Some flock enthusiasts want to go the next step and breed their own birds and/or hatch their own eggs. We’ll look at what housing needs those two specialized activities each have. We ask your patience as we complete all the above pages and add them to the website. As those pages are completed, we hope they will answer readers’ questions about poultry housing. We invite readers to send us any additional questions, and/or propose new categories which we can add to the above. All the above categories are important for flock owners to consider as they build, or refurbish, a building for use as a chicken coop. Yet each of those topic pages could only cover the most basic summary of information. We wanted to offer more. So in early 2014, we released a self-published book called The Chicken Coop Manual. That Manual covers all the above topics, plus more, to give flock owners a very comprehensive source of information on coop design, function, features, and options. If the various pages on our website leave you hungry for more information, we invite you to consider The Chicken Coop Manual as the next logical step in designing, building and using your very own chicken coop. In our years of owning and managing birds, we have learned a lot about what works, and what doesn't. Sometimes, we've learned things the hard way when we tried something that didn't go the way we planned. Each of the above topics is explored in some detail on our website. However, we rarely have all the room we need for each topic, on just one webpage. So we have compiled everything we've learned into a new self-published book, called The Chicken Coop Manual. It covers all the topics above in great detail, plus quite a few more. We also review 20 different coop designs and describe their various advantages and disadvantages. Visit our Chicken Coop Manual page for more information about the book. Thank you for your support - 100% of book sales go back to supporting our farm!